"Bad Faith"/ "Falsely Stated" / "Withheld ..favorable appellate ruling" / "Misconduct"
YET THE NAPA COURT USES HER FOR CUSTODY - CRAZY RIGHT!!! NO SURPRISE COMING FROM NAPA COURT SYSTEM THAT CLAIMS "JUSTICE"
Court appointed attorney to represent the interest of children. This usually occurs when a spouse or court requests to have an attorney represent the children. It can also occur when a child requests this, however most children don't know anything about law and or the ability to have their own legal council. In my case, I did not know this existed? But my children "interestingly" enough knew that they had a right to have their own attorney! Elkins task force, which was the result of a California Supreme Court decision, Elkins v. Superior Court, 41 Cal.4th 1337 (2007) "attorneys who represent children are now required to account for their recommendations and opinions, instead of simply rubber stamping what minors’ counsels have typically done in the past." - Ann Laning should have her Law Licensed revoked! Ann Laning's poor conduct is an example of why attorney's who are NOT licensed in Psychology or health care should NOT be allowed to make recommendations to the court - Ann Laning should be ashamed of herself! Anyone and everyone harmed by her, should file a complaint with the State Bar!!! CA Bill AB 939, Family law proceedings. California Family Code Section 3151 - counsel appointed under this chapter is charged with the representation of the child's best interests. Q&A: Do I get to Pick Minors Council? - NO. The Judge picks the children(s) attorney, usually on a rotation basis and or availability, however it I highly recommend that you find out if you are ok with the attorney chosen. Don't just agree to whom the Judge picks and be Especially Careful if your spouses attorney is quick to agree to the attorney the court suggests. Be Very Careful ! I highly recommend you avoid having Ann Laning represent your children! Below complaint is a prime example of why NEW LAWS are going to in effect to "help" deal with Attorney's Like Ann Laning - Whom a BK Judge referred to Ms. Laning - "bad faith", "falsely stated", "cannot demonstrate good faith" and whom is HIRED & Paid by the Napa Court System - Crazy You Say - Welcome to Napa Court "Kangaroo Justice"
The factual basis for this complaint arises from Mrs. Laning’s handling of case between ------ vs -----. Equally important are numerous prior cases and likely ongoing cases of similar nature based on information, facts and belief as presented within this document occurring at the Superior Court of Napa. Based on information and belief, Mrs. Laning breached being an officer of the court and violated her duty as an attorney (Bus. & Prof. Code, § 6103) by misleading judges (Bus. & Prof. Code, § 6068, subd. (d)) and by committing acts of moral turpitude, dishonesty & corruption (Bus. & Prof. Code, § 6106) among various other violations of B&P Codes, Rules of Professional Conduct, Family Law Codes, Civil Codes and CA Civil Codes as summarized below, but not limited to. This is not an isolated incidence. There should be NO mitigating factor in Laning’s lack of a disciplinary record. She was admitted to the bar in 1976, and had been practicing for several years when the misconduct occurred. Ms. Laning’s lack of a prior record is not especially commendable, as Ms. Laning has been practicing long enough to know that her conduct was, is and remains wrong, unprofessional and unethical! Based on Laning’s long history of wrongdoing as provided herein, Laning suggests that she is capable of committing wrongdoing in the future and will likely continue to do so if not fully reprimanded. It is demanded that the review department order that Ann Cheri Laning be disbarred from the practice of law in this State and her name be stricken from the roll of attorneys. Numerous, Multiple and Repeated Instances of Unprofessional and Unethical Behavior (Bus. & Prof. Code, § 6106). Failing to Act Competently as requested by two (2) health care parishioners. Willfully Harming and Causing Stress and Anxiety to Purposely Frustrate the Court and Ultimately Harm her Client that will likely have very long term consequences to not only her client, but to several family members. Is guilty of deceit or collusion, or consents to any deceit or collusion, with intent to deceive the court or any party. ….” Cal. Bus. & Prof. Code § 6128(a). Gross carelessness and negligence violating the oath of an attorney to faithfully discharge her duties to the best of her knowledge and ability involving moral turpitude as she breach the relationship owed to her clients. 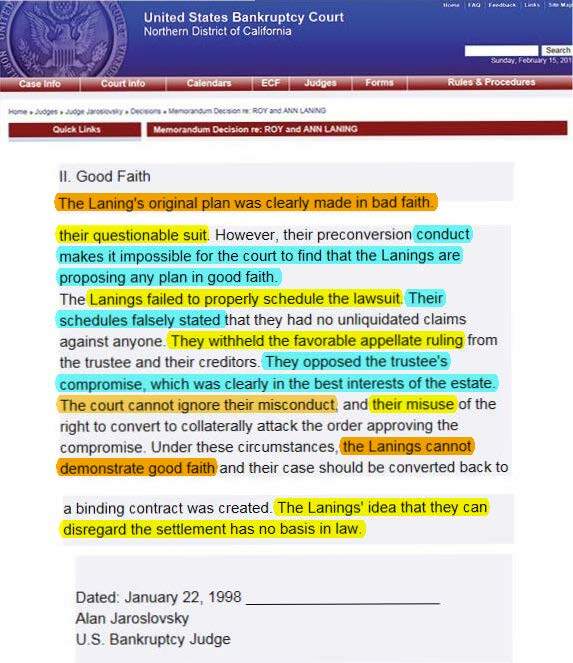 Mrs. Laning’s past history and current history raises obvious issues of competence with respect to Mrs. Laning’s representation, which find no solace within the confines of good faith, honesty and conduct as an officer and attorney of the court. As an initial matter, the complaint(s) listed below contain aspects of the above allegations, however this complaint is somewhat limited to statements made in pleadings filed with courts, because to list all the inaccurate/false statements made publicly and elsewhere would be prohibitively time-consuming. Additionally, the list is limited to very basic/fundamental statements, demonstrably false with even the most cursory review of materials. It is difficult to point out the many other false statements made in documents without venturing into “argument,” which is understood, to be unacceptable in a bar complaint. Does 1-19 listed above to include, but not limited to: Mrs. Laning is motivated by bad faith with a conscious desire to injure my family and myself the father using numerous, multiple and repeated instances of unprofessional and unethical behavior, fraudulent willful and contrived misrepresentations acting with oppression, malice, and fraud with the conscious and willful desire to deceive the court to purposefully harm and deny complainant’s due process. Based on information and belief, Mrs. Laning engaged in willful misconduct involving embroilment, persistent failure to perform judicial duties, ex parte communications, which is fundamentally at odds with the integrity, and restraint expected of an Officer of the Court and of the CA State Bar. Further, the lack of candor and accountability manifested by Mrs. Laning in and out the proceedings raises substantial concerns regarding her suitability to remain as Minor council for any child. (copy of All Exhibit’s and is incorporated by reference herein). Mrs. Laning Does 1-19 above per conflict of interest as well as a variety of other claims by using the court in an inappropriate manner to harm Complainant’s Due Process. Complainant noted during hearing and correspondence that Mrs. Laning was acting with gross carelessness and negligence violating the oath of an attorney to faithfully discharge her duties to the best of her knowledge and ability involving moral turpitude as she breach the relationship owed to her clients. Mrs. Laning asserts all types of misrepresentations, inappropriate innuendos and false claims against me in her email. On [TEXT REMOVED] an email to Mrs. Laning expressing my concern for my [TEXT REMOVED] and requested that my [TEXT REMOVED] obtain counseling. I attached a copy of a [TEXT REMOVED]. I did not get a reply. On [TEXT REMOVED] I submitted a follow up email to Mrs. Laning asking her to please reply. Again I did not get a reply. It is clear that Mrs. Laning willfully and purposefully fails to respond directly due to her personal embroilment in this case with my Ex and or her [TEXT REMOVED] and her continuance to ignore any reasonable request. Mrs. Laning expresses a position that she is Medically qualified and or trained in health sciences, behavioral sciences and or social resources to make decisions on behalf of the Safety, Health and Welfare of my [TEXT REMOVED], her client, rather than let the licensed and qualified medical experts determine what is in the best interest and course of determining what is needed or not for my [TEXT REMOVED]. Of course the reason for this is clear in that Mrs. Laning has a severe bias towards Complainant. Numerous, Multiple and Repeated Instances of Unprofessional and Unethical Behavior (Bus. & Prof. Code, § 6106). Mrs. Laning’s breached being an officer of the court and violated her duty as an attorney (Bus. & Prof. Code, § 6103) by misleading a judge (Bus. & Prof. Code, § 6068, subd. (d)) and by committing acts of moral turpitude, dishonesty & corruption (Bus. & Prof. Code, § 6106) among various other acts summarized below.. Discussion: [TEXT REMOVED] has had a long history working at [TEXT REMOVED] Appearing in Court and with the Napa Court System. [TEXT REMOVED] has personal knowledge of my case and various other cases whereby she has witnessed, observed and has worked with many other parents whereby Mrs. Laning’s has shown a long history of breaching being an officer of the court, misleading the court and committing acts of moral turpitude, dishonesty and corruption. [TEXT REMOVED] has stated that she can be available to testify in regards to this information, however she will only do so if she is subpoena by the State Bar for what I belief is her concern for her safety and welfare of living in a small town that is so interconnected. The Complaint: Mrs. Laning Does 1-19 listed above under allegations as well as with all items provided within this document. [TEXT REMOVED] testimony will be self-explanatory in the harm done by Mrs. Laning over the past decade. Essentially Mrs. Laning’s decided that [TEXT REMOVED] is ineligible to be a responsible father. Mrs. Laning in doing so, shows personal embroilment and has taken on the mission of removing [TEXT REMOVED], and based on information and belief willfully assisting [TEXT REMOVED] in alienating my children against my family and myself. The basis for this complaint is laden throughout this document, including but not limited to the fact that several health care professionals noted that it was [TEXT REMOVED] who causing the problems (copy enclosed as Exhibit D and is incorporated by reference herein) and that Mrs. Laning is and continues to be motivated by bad faith or a conscious desire to injure [TEXT REMOVED] willfully acting with oppression, malice, fraud and embroilment with [TEXT REMOVED], ignored the information and request by the health care professionals, which one of them was picked by Mrs. Laning (copy enclosed as Exhibit F1, F2, G1, G2 & G3 and is incorporated by reference herein). Violation of a child custody evaluator, whether “court connected” or “private,” must, pursuant to Rule 5.220(g), meet the stringent educational and practical requirements of Family Code § 3110.5 and 1816 and California Rules of Court 5.225 and 5.230. Violation of Family Code Section 1816 requires child custody evaluators to participate in programs of continuing instruction in domestic violence, including techniques for identifying and assisting families affected by domestic violence, and interviewing, documenting, and making appropriate recommendations for families affected by domestic violence. Violation of Family Code § 3110.5 provides for the formulation of statewide rules establishing education, experience, and training requirements for all child custody evaluators appointed by the court. The required training and experience shall include, but not be limited to, knowledge of psychological and developmental needs of children and parent-child relationships. The uniform rules also require all evaluators “to utilize comparable interview, assessment, and testing procedures for all parties that are consistent with generally accepted clinical, forensic, scientific, diagnostic or medical standards. Violated Family Code § 3110.5(b)(B). All court-connected or private child custody evaluators must also receive training in the nature of child sexual abuse. Violation of Family Code § 3110.5(b)(2). Furthermore, no person may be a court appointed child custody evaluator unless he or she qualifies as either: (1) a licensed physician who is either a board-certified psychiatrist or has completed a residency in psychiatry, (2) a licensed psychologist, (3) a licensed marriage and family therapist, (4) a licensed clinical social worker, or (5) a “court-connected” evaluator who has been certified by the court as meeting all the qualifications for court-connected evaluators specified by the Judicial Council. Violation of Family Code § 3110.5(c). Detailed educational and training requirements are set forth in California Rules of Court 5.225 and 5.230. Violated Complainants Constitutional Rights and his Right to Due Process when Mrs. Laning presented her opinions to the court against the opinions of two CA Licensed Health Care Practitioners who are Experts in and Specialize in Family, Children and Custody issues. Mrs. Laning as such acted in a manner indistinguishable from that of a custody evaluation expert (insert - SEE NEW 2012 LAW). Discussion: Mrs. Laning’s review of custody, visitations and that the court would decide custody issues based on the report provided by said health care professional : (copy enclosed as Exhibit F1, F2, G1, G2 & G3 and is incorporated by reference herein). Mrs. Laning gave the impression that she was in agreement on or about [TEXT REMOVED] regarding the stipulation that a review of custody, visitations and that the court would decide custody issues based on the report provided by said health care professional. Mrs. Laning stipulated in favor of Petitioner that [TEXT REMOVED] shall do counseling sessions and report to the court over the request and objection from Respondent that [TEXT REMOVED] was far more qualified to do the counseling sessions and provide a report for this case. Mrs. Laning obtains [TEXT REMOVED] report, findings and suggested course of action. On [TEXT REMOVED] and Dr. [TEXT REMOVED] are duly sworn and take the stand. A copy of that minute order is attached as Exhibit H and is incorporated by reference herein. On [TEXT REMOVED] Dr. [TEXT REMOVED] continues her testimony and other are sworn in and provide testimony that day. A copy of that minute order is attached as Exhibit I and is incorporated by reference herein. On [TEXT REMOVED] Mrs. Laning was clearly was aggravated and did not want to hear any further discussion on the issues at hand. On [TEXT REMOVED] Mrs. Laning , a legal authority and non-physician unilaterally went against her own demand / request / order as stipulated by the parties per Exhibit E2 to have a health care professional determine and provide the next course of action for the best interest of the children. On this day Mrs. Laning did not want to accept any findings / statements such as [TEXT REMOVED]report finding that [TEXT REMOVED] was instructing the children against court orders. statement from Napa Access (A copy of that minute order is attached as Exhibit D and is incorporated by reference herein) who showed that [TEXT REMOVED] was causing the issues at hand “Mom walked [TEXT REMOVED] in and said I should not fall for anything [TEXT REMOVED] tells me. She said [TEXT REMOVED] is a bad man”, “Don’t belief what my dad says. He is lying. He is a bad man”and most importantly is that Mrs. Laning is an Attorney – Not a Dr. or health care professional who unilaterally denied the two health care professional examinations, reviews, advise and suggested course of action thus denying Respondent’s ability for due process and in the long term the health and safety of his children. Based on information and believe, Mrs. Laning constituted an abuse of authority and demonstrated embroilment. It violated California Attorney ethics that as an officer of the court that they shall uphold the integrity of the court, shall avoid impropriety and the appearance of impropriety), shall promote public confidence in the integrity and impartiality of the court), attorney shall be faithful to the law, attorney shall be patient, dignified, and courteous) and attorney shall accord to every person who has a legal interest in a proceeding the right to be heard. Mrs. Laning unilateral decision against the advise of two licensed health care professionals, along with, embroilment, willful negligence, amongst many other issues. Mrs. Laning, Esq. has no formal training and or ongoing education in health care and as such is a non licensed health care professional who willfully and purposefully went against the request of two (2) board certified licensed health care professionals, with the one licensed health care professional [TEXT REMOVED] hand picked by both Mrs. Laning and [TEXT REMOVED]. Both health care professionals [TEXT REMOVED] stated in written documents and under oath in open court that the court should have Dr. [TEXT REMOVED] re-exam the information. Mrs. Laning, Esq., a non-health care professional demanded that the court ignore their written and open statements to the court and deny the children and complainant - hence [TEXT REMOVED] due process. Ongoing Campaign and long history of Mrs. Laning, Esq. willfully and purposely harming numerous individuals in the Napa Superior System using her court appointed position to willfully and purposely harm families – Per statement by [TEXT REMOVED]. Mrs. Laning’s willful mis conduct has caused far reaching harmful decisions without medical training, medical degree, medical license and or adequate knowledge of medicine, psychiatry and or psychology. Mrs. Laning demanded the court would decide custody issues based on the report provided by said health care professional - A copy of that court signed stipulation is attached as Exhibit E1, E2 & E3 and is incorporated by reference herein. Prior to this stipulation Petitioner demanded that [TEXT REMOVED] provide this service. Respondent demanded that [TEXT REMOVED] provide this service as Respondent felt that she was far more qualified to help my children, understand the behavioral issues and have the expertise to handle this very contentious case. Again another legal case ensued and as anticipated by the Respondent based on the ongoing bias against Respondent and Respondents Attorney’s as noted herein and throughout this complaint, Mrs. Laning pushed for and choose [TEXT REMOVED] over [TEXT REMOVED] even though [TEXT REMOVED] was far more qualified on several fronts including but not limited to her higher education and length of time in handling issues and cases of this nature. When [TEXT REMOVED] provided his evaluation, findings and recommendation on [TEXT REMOVED] (A copy of his report is attached as Exhibit F1 and email reply F2 and is incorporated by reference herein) along with similar evaluation, findings and recommendation by [TEXT REMOVED] PhD on [TEXT REMOVED] whom specializes in child psychology, parental alienation and high conflict cases - A copy of that report is attached as Exhibit G1& G2 and email reply G3 and is incorporated by reference herein), both [TEXT REMOVED] and [TEXT REMOVED] professional opinions were that the original report issued by [TEXT REMOVED], regarding family psychological evaluation and fitness for custody was written previous to disclosure of additional important information regarding the case and that [TEXT REMOVED] should re-review the case, given the new information. Again Mrs. Laning’s clear bias and as a Non-Physician with no medical training, no training in health, health care, health sciences, behavioral sciences, social resources, Mrs. Laning went against her own request that the next course of action would be determined in this case [TEXT REMOVED] thus quashing the very recommendations he requested, including that of a noted PhD Forensic Psychologist - Dr. [TEXT REMOVED]. This action forestalled any recourse the Respondent had in rectifying the gross miscarriage of justice that occurred in Judge [TEXT REMOVED] courtroom. The transcripts regarding the court appearance will show that Mrs. Laning: “interjected herself into the proceedings by engaging in a sympathetic and affectionate stance on behalf of [TEXT REMOVED], Esq and [TEXT REMOVED] and not the Minor child, in front of the Respondent and Opposing counsel. Mrs. Laning’s remarks violated her duty to be patient, dignified and courteous, and gave the appearance that she was unable to remain neutral and impartial in the consideration of the matter. She unnecessarily embroiled herself, as she has shown a propensity to do on other occasions, in a needless, willful and harmful conscious desire to injure father. It is believed that Mrs. Laning’s to protect her job will likely seek to minimize most if not all the information, beliefs and facts provided herein and it is believed that Mrs. Laning will not appreciate the inappropriateness of her conduct and based on the number of incidents with my case based on belief and facts provided herein, Mrs. Laning would likely again violate the California Code of Ethics and many other families, if allowed to remain as an officer of the court and minors council. The “maintenance of public confidence in the integrity and independence of the judicial system and representing minors on behalf of the Court and Families” also weighs in favor of removal. The public understands that Minors Council in not attempting to provide what the court hopes in having both parents involved in their children’s lives, Ex Parte communications and the making of health care decisions when Minor’s Council is not a licensed health care provider, nor has any health care experience knows that it is wrong. The public need not tolerate a Minor’s Council who dismisses such a serious case without providing due process and thus performing an act that exceeds the Minor’s Council lawful power with a conscious disregard for the limits of the court’s authority. When Minor Council becomes embroiled in a matter, the Minor’s Council abandons his or her officer of the court rule. Mrs. Laning’s misconduct not only compromises confidence in the integrity of the judicial system, but also potentially interferes with the administration of justice and hurts the children and people. Mrs. Laning’s inactions and actions continue to have an impact on my children, my family and myself to this day. I love my children and I have not done the things I have been accused of and there is no kernel of truth nor any proof of the baseless claims made. I repeatedly informed Mrs. Laning that complaints and statements made by my Ex are easily proven false and pleaded with attorney Mrs. Laning to conduct and investigation into certain issues and facts. Most importantly, I did advise attorney Mrs. Laning there are witnesses that must be contacted who would refute everything that my Ex stated. She failed to investigate the falsity of the allegations and disregarded exculpatory information and evidence. Minor's counsel is supposed to act as fact finders. They learn about the child's best interests including the health, safety, and welfare of the child. Minor's counsel may gather information from interviews with the child, parents, therapists, doctors and by evaluating school records, medical records, psychological evaluations, and any other record that provides relevant information as to the child's needs. Mrs. Laning failed miserably in this area as she spoke to those who were embroiled in this case including those she is friends with, heard only one side from people no knowledge of my family or myself as proven in a deposition that was done on Mrs. [TEXT REMOVED]– Note Exhibit B4 and for B3 [TEXT REMOVED]& [TEXT REMOVED]. Had Mrs. Laning even done a smidgen of due diligence on this case and spoke with [TEXT REMOVED], any of the neighbors around our neighborhood, the members of our community pool and truly checked into [TEXT REMOVED] past psychiatric history whereby according to her father [TEXT REMOVED], [TEXT REMOVED] was checked in to a Psych Ward for Abuse, Anorexia, Mental Manipulation and Suicide Watch, Mrs. Laning would have learned that it is [TEXT REMOVED] causing the harm and unnecessary ongoing baseless legal wrangling. Mrs. Laning would also have learned that I am a great Dad who loves and misses his children and that as their father; I was very active in their lives. Heartbreakingly my children are without a Father, Paternal Grandparents, Cousins and other extended family and they have been fed and continue to be fed a great deal of false hate directly due to Mrs. Laning being embroiled in this case and by her not acting in the required professional manner as provided to her by the law to help avoid harm to the children. As such, it is of no surprise that she encouraged the legal and unethical harm that took place in and out of court that will at this point forever harm my children in many ways and likely affect their own relationships in a negative manner now and into the future. For the reasons set forth in this formal compliant, it is formerly requested to protect the interest of public, children, my children, my family and myself that the California State Bar commission hereby disbarred Mrs. Ann Cheri Laning. Cal Lic #68717 from the practice of law in this State and that her name be stricken from the roll of attorneys. Furthermore it is formerly requested to protect the interest of public, children, my children, my family and myself that the California State Bar commission hereby at minimum temporarily remove Mrs. Ann Cheri Laning from providing Minor Council service by immediately informing the Napa Superior Court of this demand until a full investigation & inquiry can be completed into this matter – It is strongly believed that anything less and or failure to do this will likely subject further children and families to unnecessary harm. Due to time constraints, I am confident that I could provide more information to consider, however I hope that what I provided at the moment is sufficient enough regarding the above. If you have any questions, please feel free to contact me at any time at [TEXT REMOVED]. Below are a few other court attorney's that the courts appoints. The Court Refuses to provide the list of the attorney's they use, even though the court is a public domain and paid with public funds! ... Welcome the "unbiased" Napa Court System that States "JUSTICE" on it's front door steps!